The White Star approaches the Shadow’s homeworld of Z’ha’dum on the Galactic Rim. It would appear that scientists have confirmed that the outer edge of the Milky Way is a bad location for life to even think about existing. This research reminded me of the “Galactic Rim” in the 90’s sci-fi TV series Babylon 5. The Rim is the mysterious region of space right at the edge of our galaxy where only the hardiest of explorers dared to venture. 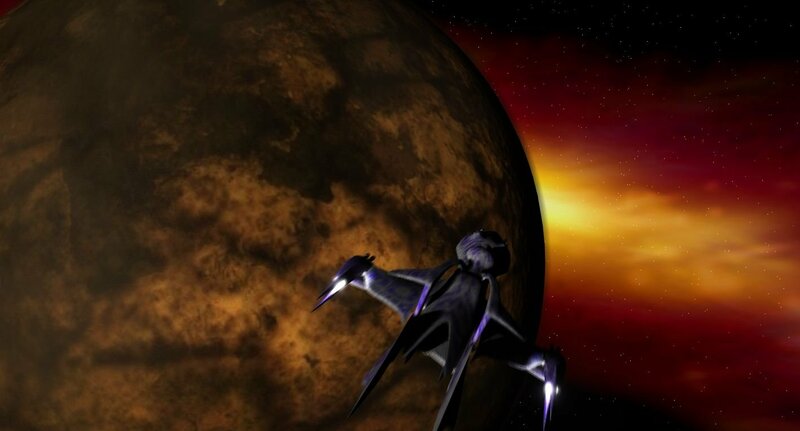 As explained in the season 2 episode of B5, “In the Shadow of Z’ha’dum,” Captain Sheridan (Bruce Boxleitner) discovers that his wife (when exploring The Rim) went missing on a planet called Z’ha’dum. It turns out that an angry ancient alien race — called the Shadows — lived on this mysterious world and their discovery led to them being used in all kinds of plots during the latter four seasons of this awesome sci-fi show. However, the existence of any kind of life (let alone life as complex as the evil Shadows) in the badlands of the Milky Way is looking very unlikely. Located some 62,000 light years from the core of our galaxy (over twice the distance of the Earth from the galactic centre), two very young star clusters in the constellation of Cassiopeia have been studied. Chikako Yasui, Naoto Kobayashi and colleagues at the University of Tokyo, Japan, found these clusters in a vast cloud of gas and dust called Digel Cloud 2. The stars inside these clusters are only half a million years old, and the majority of them should possess proto-planetary disks (which is characteristic of local star-forming regions). However, it would appear that these stars contain very little oxygen, silicon or iron (i.e. they have very low metallicity) and only 1 in 5 of the 111 baby stars analysed in both clusters have disks. If proto-planetary disks are rare, this means there will be a rarity of planets. This is an obvious bummer for life to form. After all, Life As We Know It™ is quite attached to evolving on Earth-like planets. So why are these young stars lacking proto-planetary disks, when local star forming regions don’t seem to have this affliction? The authors of the paper, soon to be published in the Astrophysical Journal, suggest that these stars did have disks, but some mechanism is rapidly eroding them. The most likely scenario is that low metalicity proto-planetary disks are more susceptible to photoevaporation. Simply put, these disks evaporate when exposed to EUV and X-ray radiation from their parent stars far more rapidly than disks that are metal-rich. Therefore, if an alien race was able to form, they’d be very rare or they’d be very different from what we’d expect “life” to be like (i.e. they thrive in low metalicity star systems). Sounds like the mysterious Shadow homeworld of Z’ha’dum would be a very rare sight on The Rim of our Milky Way after all.